The FBI is providing the following information with HIGH confidence. The FBI has observed malicious actors targeting healthcare related systems, perhaps for the purpose of obtaining Protected Healthcare Information (PHI) and/or Personally Identifiable Information (PII). These actors have also been seen targeting multiple companies in the healthcare and medical device industry typically targeting valuable intellectual property, such as medical device and equipment development data. 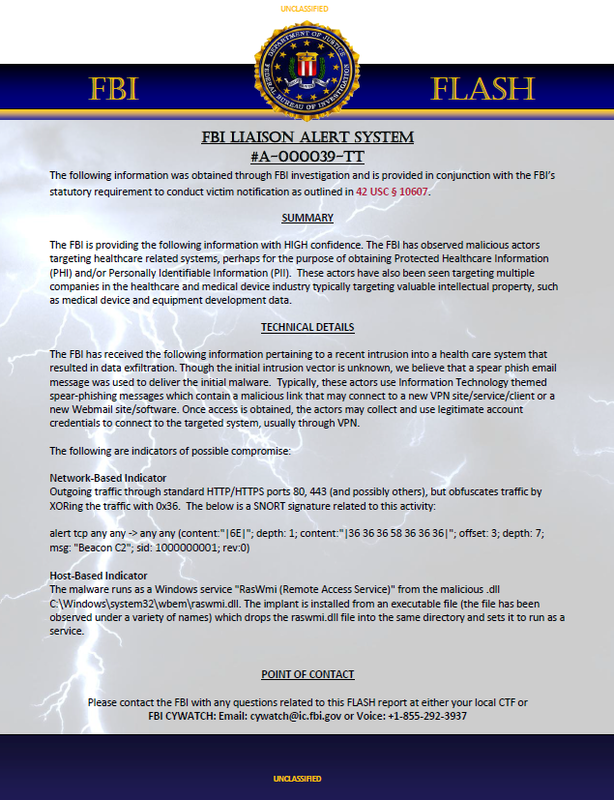 The FBI has received the following information pertaining to a recent intrusion into a health care system that resulted in data exfiltration. Though the initial intrusion vector is unknown, we believe that a spear phish email message was used to deliver the initial malware. Typically, these actors use Information Technology themed spear-phishing messages which contain a malicious link that may connect to a new VPN site/service/client or a new Webmail site/software. Once access is obtained, the actors may collect and use legitimate account credentials to connect to the targeted system, usually through VPN. The malware runs as a Windows service “RasWmi (Remote Access Service)” from the malicious .dll C:\Windows\system32\wbem\raswmi.dll. The implant is installed from an executable file (the file has been observed under a variety of names) which drops the raswmi.dll file into the same directory and sets it to run as a service.